The large blood vessel in the human body is called aorta. Aorta is responsible for carrying the blood from heart to the abdomen, legs and pelvis. When the aorta becomes weak, it swells and bulges like a small balloon. The large blood vessel in the human body is called aorta. Aorta is responsible for carrying the blood from heart to the abdomen, legs and pelvis. When the aorta becomes weak, it swells and bulges like a small balloon. The bulging and swelling of the aorta is called abdominal aortic aneurysm. Aortic abdominal aneurysm is not a severe condition but it can become life threatening when the swollen aorta ruptures. People suffering with Asthma are at higher risk of developing abdominal aortic aneurysm. The risk increases up to 50 % in patients suffering with asthma. Patients suffering with asthma are more likely to have ruptured aortic walls. Mostly men suffering with asthma within six months are more likely to have aortic aneurysm rupture when compared to those without asthma. Anti-Asthmatic drugs also play a major role in increase the risk of abdominal aortic aneurysm. High blood pressure in patients weakens the aorta wall and thus increases the risk of developing aortic aneurysm in the body. Genetic changes in the body also play an essential role in increasing the risk of abdominal aortic aneurysm. Smoking generally leads to many different diseases along with abdominal aortic aneurysm. Smoking directly damages the walls of your arteries and can lead to bulging of the aorta walls. Smoking also increases the risk of high blood pressure, which in turn increases the risk of developing abdominal aortic aneurysm. People above 60 years of age are more prone to abdominal aortic aneurysm. This disease condition is generally seen in males above 60 years of age. Infections in the aorta and other associated arteries can cause abdominal aortic aneurysm. In very few cases vascular infection results in development of the abdominal aortic aneurysm. Vascular problems are very common in people that can increase the risk of aortic aneurysm in patients. People who are overweight or obese are more likely to develop aortic aneurysm when compared to others. If you and any of your family members have a history of aortic aneurysm, then you are at high risk of developing abdominal aortic aneurysm. High cholesterol weakens the aorta wall and increases the chances of development of abdominal aortic aneurysm. You need to maintain the cholesterol levels in your body to prevent abdominal aortic aneurysm. Ultrasound of the abdomen is done in the initial stages of abdominal aortic aneurysm. Computed tomography scan is done to confirm the size of the swollen aortic wall. Computed tomographic angiogram is done in the last stages of aortic aneurysm that helps in surgical planning. Abdominal MRI study is also performed to check the size and stage of aneurysm to avoid complications. Aortic aneurysm can be treated with the help of aortic stenting. Aortic stents are small metal coils that are inserted through a small incision into the skin. X-rays are used to insert the stent graft into your aorta at the place of aneurysm. The stents are generally opened using a spring-like mechanism and it can then be attached to the aortic wall. After the attachment to the aorta wall the aneurysm generally shrink around the stent graft. After the insertion X-rays are again done to confirm whether the stents are inserted at the right place or not and to make sure that the aneurysm is bleeding inside the body. Endovascular stent grafting is done mainly to prevent an abdominal aortic aneurysm from rupturing. Aortic stenting is the safest and minimally invasive endovascular procedure with the highest success rates. 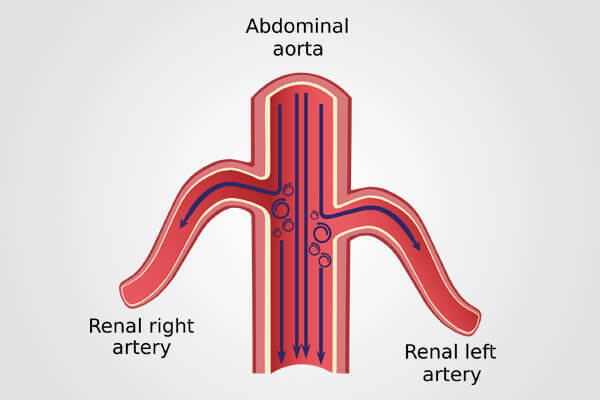 Endovascular surgery can be done to cure abdominal aortic aneurysm. One of the most renowned and successful Endovascular surgeon in Hyderabad is Dr. Abhilash Sandhyala.